Small kitchens are all in need of two things: more storage, and more prep space. A kitchen island gives you both! You can make a DIY kitchen island from repurposed and upcycled elements, without spending a lot of cash. Here are the basic instructions on how to make a kitchen island, and some inspiration and tutorials for customizing it. Building a kitchen island is nothing more than creating a sturdy kitchen surface, so all you need is a base, a top, and some options. Step One: Find a sturdy base such as an old desk, two dressers back to back, or even sturdy wire shelving placed on its side. Make sure the base is just a couple inches shorter than the height you wish your work surface to be. The average height for a work counter is 30-34 inches. Step Two: Create a top for your kitchen island. Depending on what you will be using the prep area for, decide if you need a cutting surface or simply a work area. Cutting surfaces should be made of wood. Other surface ideas are metal, laminate and stone. Home improvement stores sell these pre-cut. Step Three: Attach your top to the base with construction adhesive or silicon caulk adhesive, or another method that will create an unmovable surface. You want your surface to be secure to prevent accidents while cutting or prepping food. Step Four: Add options. 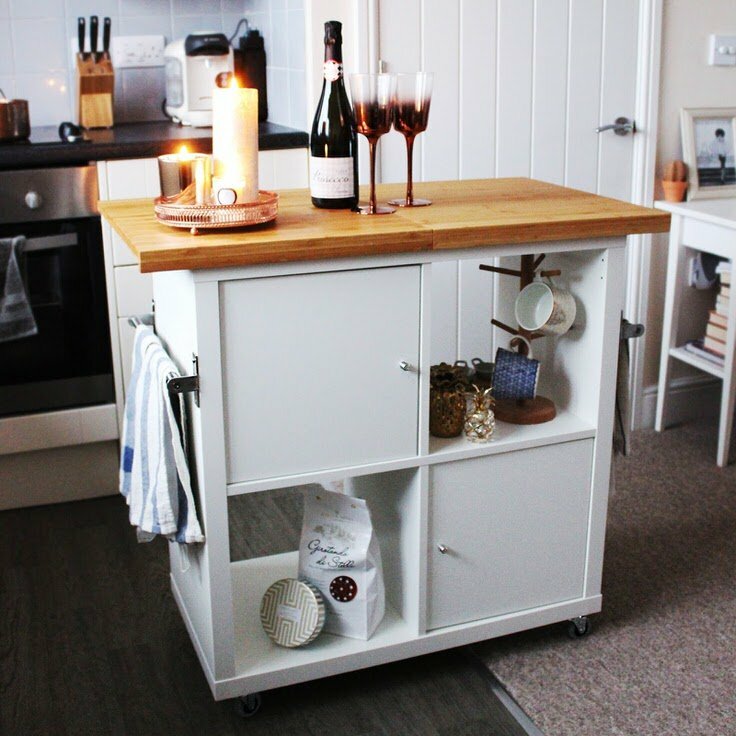 Caster wheels can be easily added to create a portable kitchen island, which can be pretty useful in a small space. Simple shelving under the top can add much needed storage, and hooks and towel racks placed along the back side can hang kitchen necessities. Those are the basics! You can obviously alter these simple instructions to match your materials and situation. 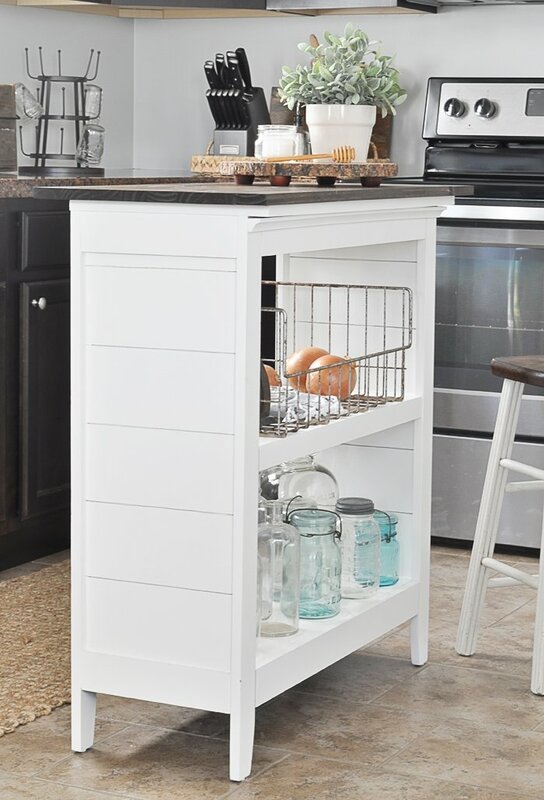 Try one of these inspirational ideas and tutorials for a unique and creative DIY kitchen island! ‘BHG‘ used two Hemnes Ikea sofa tables and a laminate top to make a kitchen island with lots of storage. Don’t forget the wheels for portability! Full tutorial for this project. From ‘Yellow Brick Home‘, make a kitchen island from a dresser with this step by step tutorial. You could use a thrift store dresser, or a new one. Lovin’ on the navy, and the details with the gold hardware! 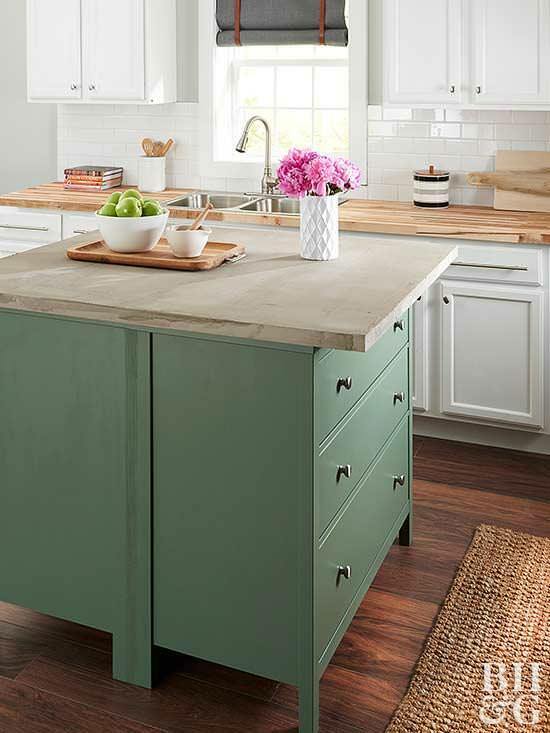 Learn how to make a kitchen island from two dressers and a concrete top from ‘BHG‘. This tutorial even has instructions for making the island countertop! All those drawers are perfect kitchen storage. 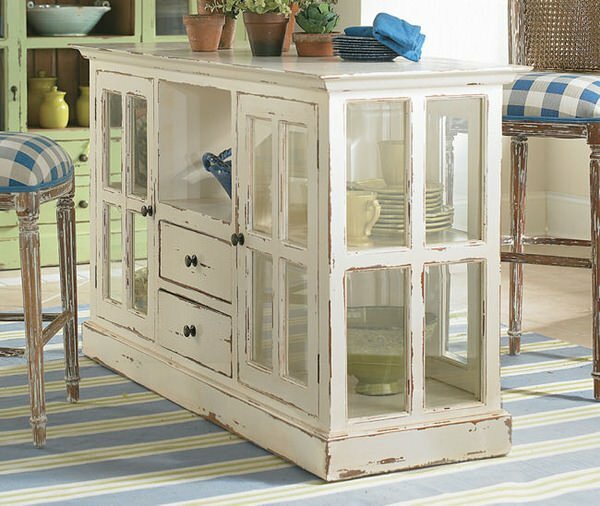 Jump on over to ‘Little Glass Jar‘ and learn how to make a kitchen island from an old bookshelf! You have to go see the “before” picture! 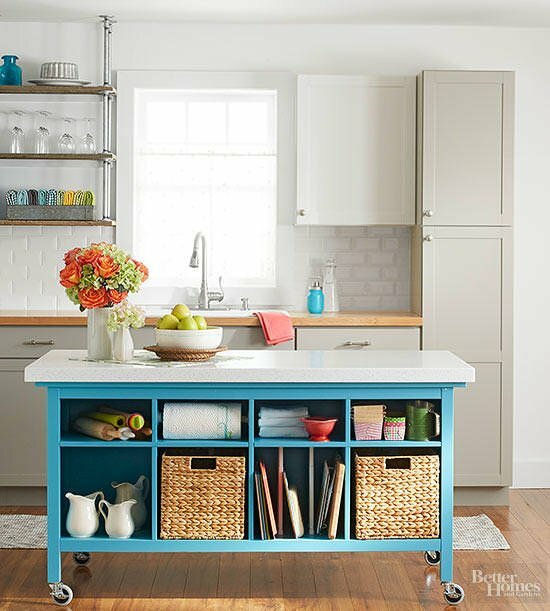 Easy kitchen island idea anyone can do! 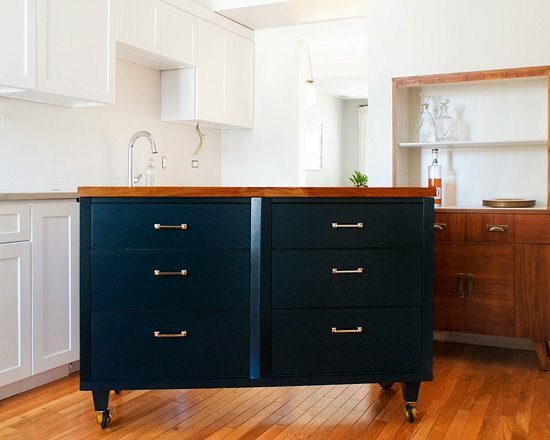 ‘Jen Lou Meredith‘ has a DIY kitchen island Ikea hack for us that makes it really easy. She used four shelving units and two chopping boards from Ikea. Genius! 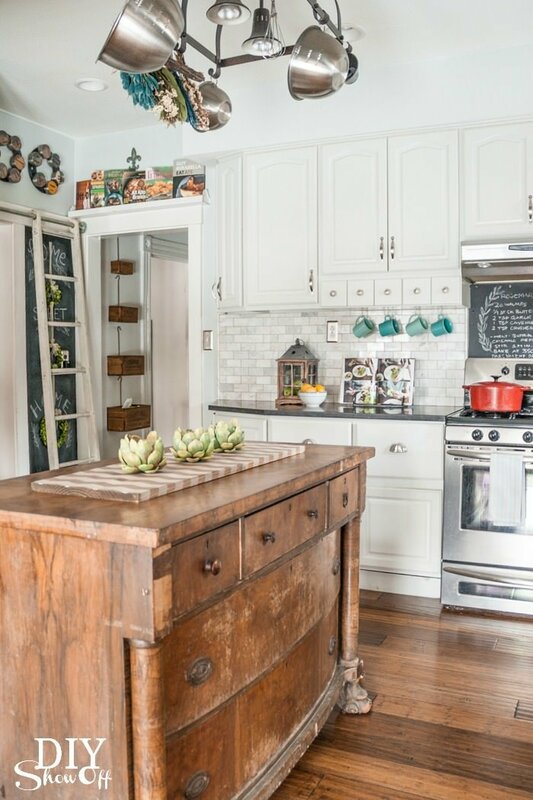 Here is an up-cycled dresser turned kitchen island by our friends at ‘RemodelAholic‘, with their complete tutorial. Want a really easy DIY kitchen island? ‘DIY Showoff‘ just pulled an old vintage dresser into the kitchen and pressed it into service, as is! I love this! 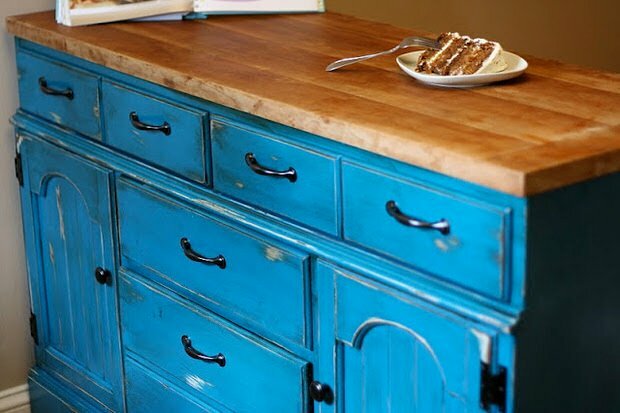 All the old patina of the dresser can only get better getting used in the family kitchen. 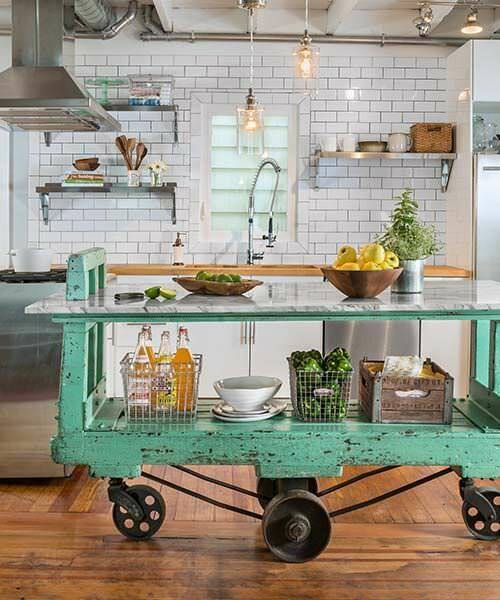 From ‘This Old House‘, let this factory cart turned kitchen island idea inspire you! Love this kitchen island that could be created from kitchen base cabinets with glass door fronts. This could be a really creative project for an intermediate DIY’er! Source Unknown. Inspired to build a kitchen island? Great! Don’t forget to get even more ideas at our post on DIY kitchen island ideas & projects. And then when you are done with that, jump on over to our posts on How to Reupholster Almost Anything and New and Modern Pegboard Ideas! I want directions on how to make the island out of pallets! Love that idea, any how-to directions that I can find? Im sorry, its not our project, so we don’t have the info… Sorry we couldn’t be more help!I would suggest googling or searching Pinterest for a tutorial! Good luck! Love the table, will use your idee for à little door-table in the “véranda” = porch. Hi! I just wanted to let you know that the last island you shared on this post for inspiration was designed by me. It is actually covered by a beveled piece of glass (the equivalent of what a glass top kitchen table is made of) and can certainly be cut on. I had it custom cut by a local glass company. There are rubber corners to keep it in place. Thanks for being inspired by my design! Hi Callie! What a gorgeous piece! Is there a place we can link back to? How would you like to be credited for your design? We always want to give credit where it’s due, so please let us know… And thank you for the tips on how you made it! Hey Callie, I am actually working on a similar project, turning a door into a counter height dining table for my new place. Can you give me an idea what the cost was for the glass on yours? (if you can let me know the dimensions as well that would be wonderful). Thanks so much! I have a dining room table done similarly, we did it about 15 years ago and the glass at a local place was about $100 maybe $120, not bad considering we had the door from our 1900 house! We also put wood trim around it to cover the door mechanism parts and stained it. We have all family antiques displayed in it,(it has sunken middle) silverware, coins, old opera glasses, keys, jewelry. Fun to create! the door idea….what is on top to make it sanitary, (so you don’t get that chipped paint and who knows what else was on the surface previously)? Seems to be a big piece of glass. How to Reupholster Almost Anything!